I’m excited to have the opportunity to share some interviews with Dutch Australians…would you like to share your story? Contact us. My Opa & Oma were born in Groningen, NL, and migrated to Tasmania, Australia, in the 1950’s to start a better life. My dad and his 4 siblings were all born in Australia. What is your level of fluency in English/NL? Father married Australian wife. I’m the eldest of 3 children. I am married to an Australian. If you have children are you raising them bilingually? (We don’t yet have children but…) When we have children we will teach them as much Dutch as we ourselves know, which is not a great deal but we are learning. What are your feelings about Australia? Australia is a land of opportunity, very multicultural. Not all cultures come here to improve the country like the Dutch have and do. What are your feelings about The Netherlands? The Netherlands is a beautiful country with some very clever ideas, reclaiming lands with dykes, etc. It is a friendly country and there’s no better way to see it than on a bicycle with the wind blowing your hair behind you. I love that there is a no helmet law and cyclists have their own roadways, traffic lights and roundabout lines! Depending on which country you are based in, do you visit Australia/The Netherlands at all? My husband and I just returned from a week in the Netherlands in October 2011, and will return as part of another Europe trip in 2013 to experience the Tulip Festival. 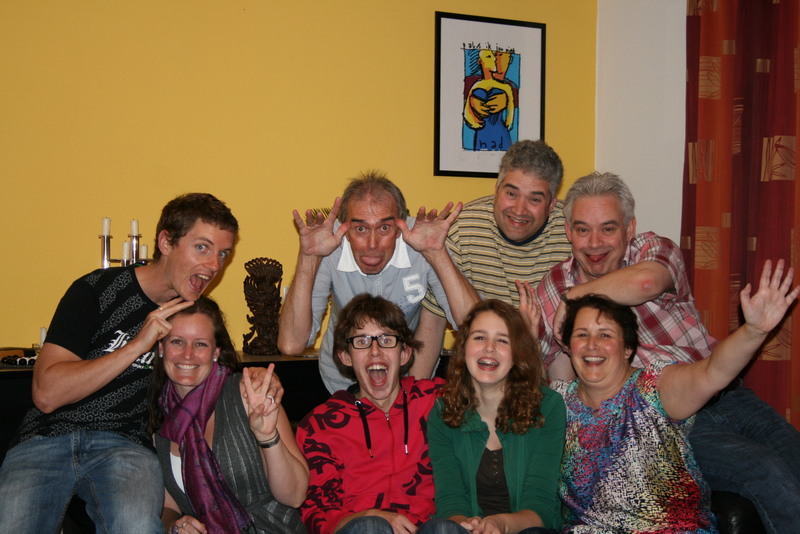 I have second cousins and a couple of Great-Aunts and Uncles still living in the Netherlands. How do you communicate with family in the other country? How regularly? We communicate by email mostly, but phone calls are not uncommon if there’s an urgent need to discuss something. Emails are generally fortnightly or monthly. 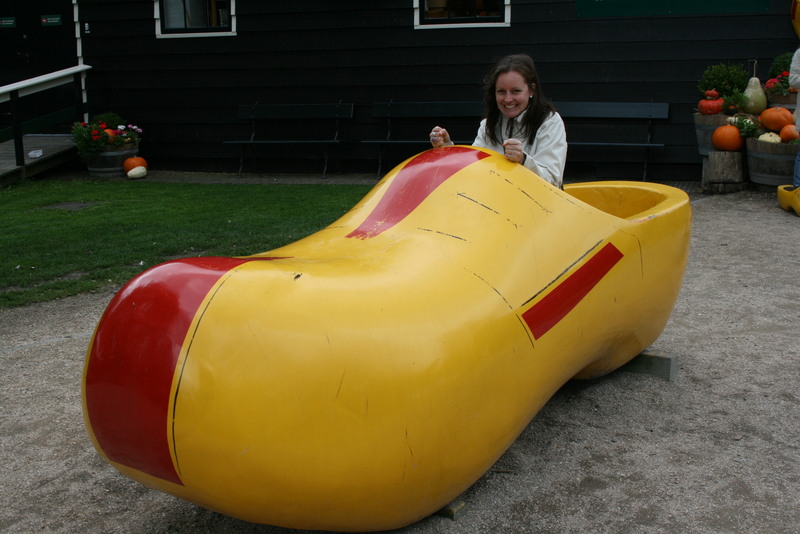 Do you celebrate Dutch/Australian holidays/traditions if you are living in the alternate country? My Oma lives in a Dutch Village in Birkdale, Brisbane (Prins Willem Alexander Retirement Village) and they all celebrate St Nicholas on Dec 5th. We usually make Ollie Bollen with her before New Year’s Eve. Any other information you’d like to share on your Dutch/Australian connections? We are part of the Christian Reformed Church of Australia and at least 50-80% of our members nationally are Dutch. It doesn’t matter which city you are in, you will always find a connection with a Dutchie through your Oma knowing her dad, or something similar. It made travel around Australia so much easier, they are always very welcoming. Bonnie is a Professional Organiser who operates a business in the Redlands district of Brisbane, Little Miss Organised. Visit the Little Miss Organised Facebook page to connect with her there. Lovely to meet you Bonnie…Aangenaam! 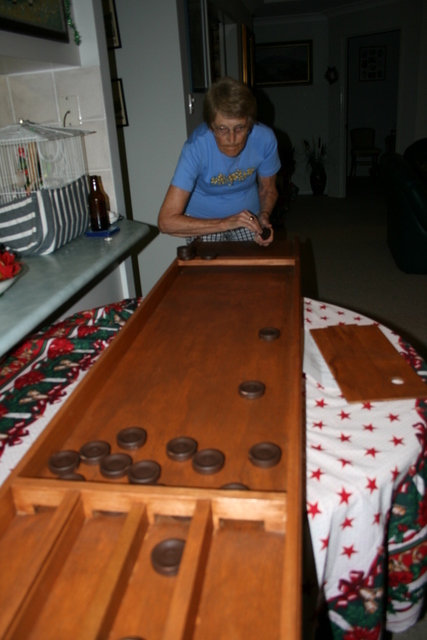 Love the look on Bonnie’s Oma’s face, as she concentrates on the shuffleboard (Sjoelbak). I hope you have time to click on the link under my name here. It’s a bit of video of my father using the shuffleboard, competing with Ron, our very Australian neighbour. My father and he were such great friends. I KNOW that Ron misses my father who passed away at 92, not THAT long ago. (“A good innings” is usually the reaction to that. Hi again Dave. Ollie has just got back to me and yes he is paynilg fro ATW and tells me your brother is skipper of the Div 2 team and that Brothers are the rivals. There ya go – all still works in down town Bundy!